To book a FREE Taster Session click here. For details about our Classes please go to the TUITION page. 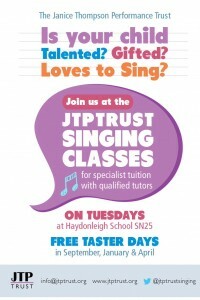 Welcome to the the JTPTrust, a Swindon singing charity, now celebrating its 13th year. We are an educational charity offering youth and children’s singing tuition plus adult workshops and events in the Swindon area. As youth providers, we organise weekly classes for singers aged 4 – 18 years and upwards, led by a team of vibrant teachers. There are no auditions, so any child may join us. In our weekly Academy classes you will be offered opportunities to perform as soloists, in choirs and to work with movement and performance. As part of your training we will encourage you to take exams, enter solo singing festivals, and take part in shows. Some of our students have gone on to become members of a national youth choirs and musical theatre groups. Former JTPTrust singers and Associates have achieved recognition in West End and operatic worlds, and enjoyed local acclaim as soloists in community choirs and theatre groups. Our ad hoc adult workshops and events take place throughout the year. In July 2014 the JTPTrust celebrated its 10th anniversary as a Charity with an anniversary Gala Concert at the Wyvern Theatre, Swindon.